An interview with TAKE SHELTER star, Michael Shannon. 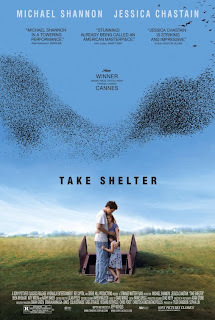 When I sat down to speak with Michael Shannon about his mesmerizing performance in Jeff Nichols’ equally transfixing film, TAKE SHELTER, Hurricane Irene had just paid a visit to his hometown, Manhattan. The media had made out the event to be potentially catastrophic but the weather came and went without much damage to mention. The media may have had egg on their faces but what if they were right? One day, they very well might be. That’s an understatement. Faced with a potentially apocalyptic storm, Curtis begins expanding an underground shelter in his backyard. Naturally, this tips off his friends and family to his increasingly bizarre behaviour. Complicating matters further, Curtis’ mother (Kathy Baker) was diagnosed with schizophrenia when she was roughly Curtis’ current age. This begs the question, is this madness or is this divine intervention? “I think what Curtis is experiencing beyond schizophrenia is just feeling unsafe because he doesn’t know who’s running the show,” Shannon clarifies. Curiously enough, Curtis is not a churchgoer, unlike the rest of his family, and yet God has chosen him to warn of what’s coming. Or, he’s totally losing it. It could go either way. “For me, one of the reasons I was interested in doing the film, is that more metaphysical, spiritual component,” says Shannon, a non-churchgoer himself. Would that I could but we all know how that turned out. If only the dinosaur having premonitions had spoken up.